Police investigating three cliff falls in Cornwall - two of them fatal - have warned teenage holidaymakers about the dangers of alcohol and high cliffs. 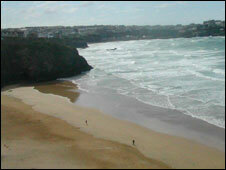 Three teenagers, all under the age of 19, fell from cliffs in Newquay in separate accidents between 28 June and 6 July. Police said there were no suspicious circumstances in any of the incidents. "This frequency of cliff falls is quite unprecedented and police are reviewing each incident," a spokesman said. In the most recent accident, a 16-year-old boy from Surrey was pronounced dead on Tolcarne beach after apparently falling from cliffs in the early hours of Monday. The previous week a 16-year-old boy broke his neck and suffered a fractured skull after falling from cliffs near the Atlantic Hotel in Newquay. 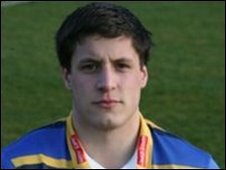 And on 28 June, the body of 18-year-old Andrew Curwell, 18, was found at the foot of cliffs at Newquay's Great Western Beach. The teenager, from Saddleworth in Lancashire, was on holiday with friends to celebrate the end of his A-level exams when he fell. Insp Dave Meredith of Newquay Police said: "Although the consumption of alcohol cannot be directly linked to any of these incidents, the police are appealing to all persons visiting Newquay this summer to be aware of the dangers of going near cliff areas after consuming alcohol. "It may not be obvious to persons unfamiliar with the town, but the majority of pubs and clubs are very close to the sea and some very high cliffs." He said the recent incidents all occurred after dark with the victims falling from the cliffs after becoming separated from their colleagues. "It is quite feasible for someone who has become lost or disorientated to walk to a dangerous cliff area within minutes of leaving any of the pubs and clubs in central Newquay," Insp Meredith said. Police are urging holidaymakers to stay in areas covered by street lighting and to use bus and taxi services. Insp Meredith said the police were working closely with local licensees, hoteliers and camp site owners to publicise the dangers involved in going near the numerous cliff areas in Newquay. "On behalf of all officers at Newquay police station I wish to send condolences to the families and friends of the young persons who have died in these tragic incidents," he added.